When people learn that I lived in New York on September 11, 2001, the response is nearly always the same. It doesn’t get any more specific than that. It doesn’t need to. Yes, I was there. That’s when I revert to my automated response. Please press 1 for the long version, 2 for the short version. I rarely give the real long version because it’s really long. I mean that day felt like an eternity to me. I remember almost every minute of the first several hours, even if I’d prefer not to. Eight years later the abbreviation “9/11” is trite. It has come to be synonymous with so many other concepts — terrorism, a turning point, fear-mongering, the unjust war in Iraq, the Bush era, al quaeda. I can’t stand the thought that people, including myself, sometimes can’t separate the tragedy of September 11th from the politics that followed. As I thought about what to blog on this weighty date, I kept drifting from my emotional memories into political rants. Exactly what I don’t want to do. That’s not what I think this day should be about. I considered chronicling the long version, the one I never tell. But to be honest, I’m not sure I could anymore. Not because I don’t remember the details. Believe me, I do. I just think that finding the precise language to describe those images would too severely open old wounds. So I decided to dig up some thoughts I wrote in the days immediately following September 11th, 2001. When it was fresh, raw and pure tragedy. When I was putting memories on paper hoping just to get them out of my head. It didn’t work. Ironically, I’m sharing them now as a reminder. New Yorkers are a strange breed. As natives, we pride ourselves in our crass reputation only because inside we find it funny. New Yorkers cold? Ha! That could only come from someone who is only visiting or has never been. Someone who has not seen the unity of parades on Labor Day and Columbus Day, or the obliging offer of help to a lost tourist. And certainly a comment like that would have come before September 11, 2001. That morning, like so many New Yorkers, I woke up and headed to work in the financial district downtown – the third largest business district in the country, following only Midtown Manhattan and Chicago. Stepping out of the subway onto Fulton Street that morning, was like stepping into a time machine that brought me to some horrific period in the future where chaos rules and fear seeps into every aspect of life. Already Flight 11 had plunged itself into the South Tower of the World Trade Center, an event I was aware of when I left for work and thought it was a horrible freak accident. What I was not aware of, as I walked through broken glass and panicked people toward my office, was that since I entered the vacuum of the subway system a second plane had hit Tower 2 and the reality struck terror, sorrow and strength into each and every witness. The air was pungent with the smell of burning plastic and electrical wires. A heavy gray cloud lingered over lower Manhattan. As I turned onto Broadway toward my office, which stands just before those two glorious towers on any other day, I now just stood in the midst of sirens, onlookers, our heroes in uniform, ailing victims and the sound of sobbing, worry and the nearly constant exclamations of disbelief. I myself stood in disbelief with tears in my eyes one block away from that symbol of New York. That bank of memories to so many New Yorkers. At that moment it was just a heart-wrenching reminder that the world had changed. It indeed was smaller. We were no longer immune to the world’s horror. The sight of a man, dressed in his business attire, jumping from what had to have been close to the ninetieth floor of Tower 1 – a height that even most city folk outside of New York can hardly imagine – brought my heartache to what I thought was its extreme limits. What unfathomable duress and agony the people inside those walls must have been enduring to choose the certain death of that terrifying fall to remaining where they were. My stomach turned, and if not for the numbness of shock and horror, I probably would have felt anger toward the monsters who perpetrated this act. But I didn’t. All I could feel was fear and sorrow for those people trapped inside – some of whom I might know – and their families and my family and my friends and the list went on and on as I thought of all the people in pain at this moment. All the people frantically worried about their loved ones. And then the unthinkable happened. As we stared at these towers trying to absorb this reality, one second stretched into an eternity. 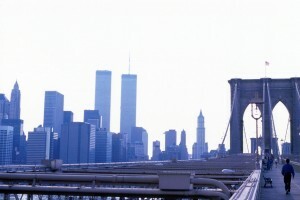 A loud boom shook the South Tower, the concrete canyons, the nearby windows, the earth, my soul. The crowd straightened and the words “Bomb!” and “Run!” and “Oh my God!” fluttered through the streets. Then the plume of dust shooting from the top of Tower 1 began the stampede. Adrenaline carried us, New Yorkers, in all directions – mine being toward the South Street Seaport. I feared being trampled, being crushed by debris, being choked with smoke. I feared the same for others. And as New Yorkers often do in times of trouble, we pulled together. We offered guidance to each other; we shouted the safest places to run and pulled each other along as the smoke caught up to us. As we reached the relative safety of the Seaport, word spread that the tower was gone; rumors spread that the second one came down as well. In fact Tower 2 still remained at the time, but the thickness of the smoke blinded us from the truth and it didn’t really matter. New York would never be the same. Together, as New Yorkers, as humans, as daughters, sisters, husbands, fathers, we cried. Fear turned into tears and we all cried. We cried for the skyline that will never look the same, the people we will never see again, the firemen and police officers we saw running toward the Towers just minutes earlier, the evil that overtook our home, and the future that we can not imagine. Today, we still cry for New York and our people. But we also well up with pride in our city and nation, our strength and unity, our rescue worker heroes, and our supportive, charitable neighbors. Our secret’s out. The Remembering the Raw Reality by MushBrain, unless otherwise expressly stated, is licensed under a Creative Commons Attribution-NonCommercial-NoDerivs 3.0 Unported License. Terms and conditions beyond the scope of this license may be available at mushbrain.net. The “Raw Reality” says it all — thanks for sharing this. This is a sad reminder to all of us of the fear we all felt for the safety of our children, knowing they were somewhere in that area that day. After learning all were safe, all I could think was “we’re at war, we’re at war…” And now, so many years later, we still await the capture of Bin Laden and remember missed opportunities to get him. Too bad the focus was misplaced and so many more have died.